Broken glass? Call our emergency glass repairs team on 131 546 for 24/7 fast repair response. We have glaziers rostered on call to respond quickly to your emergency glass repair. We’ll repair your broken glass immediately, or if that’s not possible we’ll make it secure, safe and weather proof while we fast track replacement glass and any other components required to effect a complete repair. Your glass emergency might be for any form of glass – windows, shop front windows, glass partitions, mirrors or more. 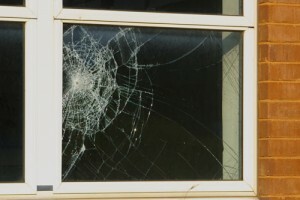 further our glaziers are experts and know how to repair broken windows, mirrors etc quickly and safely. We’ll help get you safe, secure and back to normal activities any time on any day. We’re prepared for your emergency with glazier trucks pre-stocked with the most common glass, putty and window fittings to get your home or shopfront window sealed from the elements and safe for your family, employees or clients. Once we are onsite, you can be assured your home or shop will be secured once again and look as smart as ever. There’s usually a Jim’s Glass Glaziers just near by, so we’ll be there in a flash to help with your glass emergency. Our professional Glaziers are qualified, have police clearances and are trained so you can feel confident about them helping you recover from the emergency as quickly as possible. Note that our after hours attendance does attract a call out fee. We can help ease your concerns about paying for the emergency repairs as you maybe able to claim on your insurance policy. We’ll even help you with your insurance claim too!. The fastest way to get a Jim’s Glazier to attend to your glass emergency is to call the Jim’s Glass 24 Helpdesk on 131 546. We’ll get your details and confirm when you can expect a glazier to arrive to expertly assess the situation.